Situated on just over an acre of land on Bainbridge Island, WA, The Bloedel Bunkhouse is more than just a big ole house in the woods. Built in 1977 with exquisite attention to detail, The Bunkhouse was designed to fit into and take advantage of its natural surroundings. 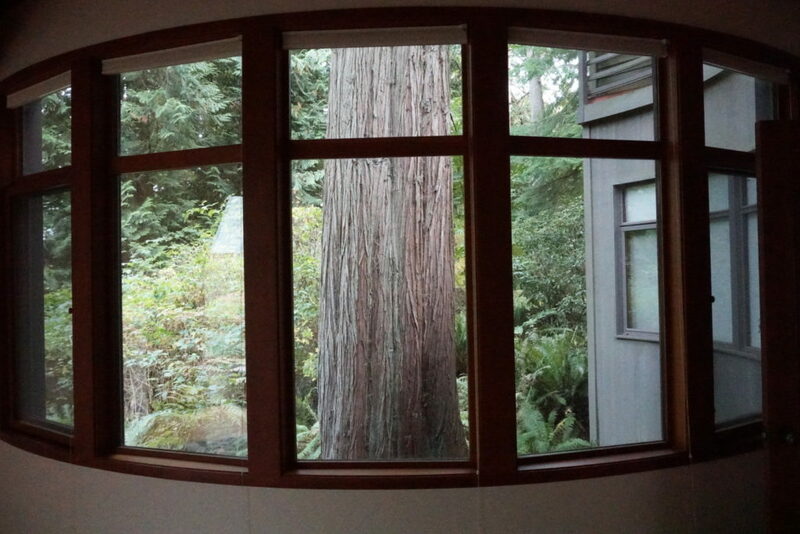 The house itself is flanked on either side by giant second-growth cedars and a plethora of native flora and fauna similar to that found in the Bloedel Reserve, which is located just around the bend in the road. Its current owners purchased the house in late 2017 and have worked to infuse the inside of it with the same fecund energy as that found outside. The space has a rare design that offers plenty of opportunities for solo contemplation, as well as rich collaboration. There is one large bunk room in the garden-level unit (four single beds total), as well as a small desk, a comfortable sitting area, and a gorgeous, live-edge cedar bar that’s perfect for coffee in the morning or a glass of wine at night. The main floor features a large living area, complete with roaring fireplace, as well as a stunning window seat built to overlook the cedars. 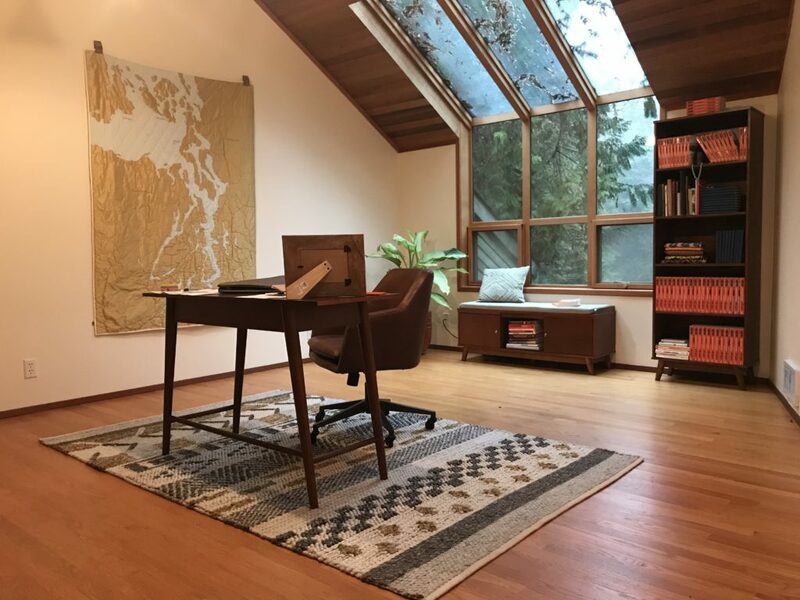 There is also a dining area, a large private office ideal for inspired solo writing, and a study that holds the owners’ collection of books — this will also serve as the sleeping area for The Seventh Wave editorial team. Each day begins around 7 a.m. on the main floor, where fresh pots of coffee and — very likely — the sound of rain, await. 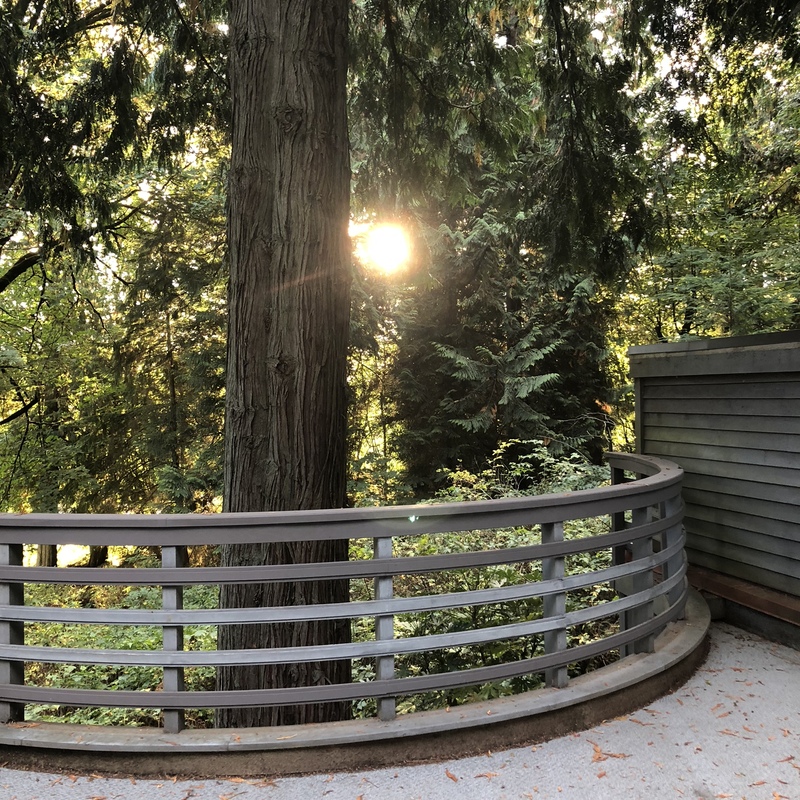 Although The Bloedel Bunkhouse itself was built in 1977, the land it is on has a rich history. For centuries it was host to the Suquamish Tribe (People of The Clear Water). The specific area surrounding The Bunkhouse was known as a gathering place for the Suquamish due to the series of ponds that run towards Bainbridge’s eastern-facing shoreline. The area was referred to as “the place where the water runs down.” When the tide is out, a visit to the shoreline (about a mile walk from The Bunkhouse) will reveal a prehistoric stone known as Haleets Rock, or “rock with the marked face.” A series of petroglyphs on the rock are said to have been carved between 1,000BC and 500CE. Although none of it is really ours to share, we are honored to have you join us in this space, if only for a short period of time.